Graham Arader: Map of the Day: "New England" from The General Historie of Virginia, New-England and the Summer Isles. Captain John Smith (1580-1631). Map of the Day: "New England" from The General Historie of Virginia, New-England and the Summer Isles. Captain John Smith (1580-1631). 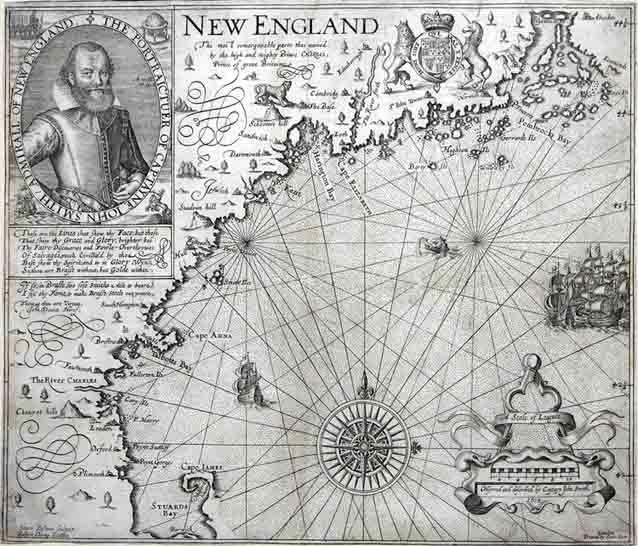 In 1614, five years after returning to England from Virginia, Captain John Smith returned to the New World, this time to the coasts of Maine and Massachusetts Bay - the region that would come to be known, thanks to the map that he subsequently published, as "New England." This map, the result of Smith's personal explorations and field surveys, covers the area from Penobscot Bay to Cape Cod. It is the earliest map devoted to the region and the foundational work of New England cartography. Smith's second New World voyage was initiated by the invitation of four London merchants who financed two ships that sailed in March 1614 with instructions to return with a profitable cargo. Smith made the Atlantic crossing in a relatively speedy six weeks, arriving off Monhegan Island near the Kennebec estuary. By that time the waters of New England, particularly Maine, were being visited by dozens of English and French fishing vessels a year. While the crew of one of Smith's vessels concentrated on catching fish and collecting other valuable commodities, Smith continued down the coast to chart and explore, lamenting the poor quality of existing maps: "[I] had six or seven several plots of those Northern parts, so unlike each to other, and most so differing from any true proportion, or resemblance of the Country, as they did me no more good, than so much waste paper, though they cost me more." In the course of his explorations, he named Plymouth Rock, describing its location as "an excellent good harbor, good lands, and no want of anything but industrious people." (This description proved the incentive, six years later, for the Mayflower Pilgrims to relocate here from their first, unsatisfactory settlement in Holland.) In mid-July, after just six weeks, Smith returned to England, but in that remarkably short span of time he had accumulated the raw materials for this highly accurate and thorough map of the New England coastline. The map, engraved by Simon van de Passe, was published as part of Smith's Generall Historie of Virginia, New-England, and the Summer Isles, one of the most important books in the history of the colonization and settlement of America.